Currently includes 7 courses for compounding sterile preparations competency assessment. Bulk discounts apply – see below for price discounts. 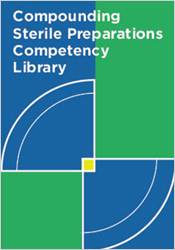 Subscribing to the ASHP Sterile Compounding Competency Library allows you and your institution to easily and efficiently manage competency assessment of all sterile compounding personnel and maintain a year-to-year record of your ongoing sterile compounding competency assessment program. This program also allows individuals to easily and efficiently maintain a year-to-year record of ongoing sterile compounding competency to demonstrate to future employers. 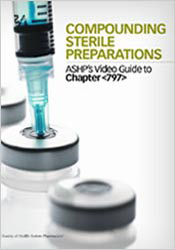 The ASHP Sterile Compounding Competency Library will continue to grow as new courses are planned. Individual courses are also available for purchase through ASHP eLearning. The annual subscription includes all upcoming courses – as well as the administrator platform for monitoring progress and printing reports. To preview Course 1 of the Library before making an institutional purchase, fill out this form.